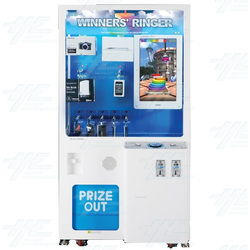 Winners' Ringer is a prize redemption arcade machine from Andamiro. This is a single player prize redemption and game of skill machine which has very addictive game play. Innovation driven, "Winners Ringer" is set to become the most unique instant prize redemption game on the market promising enormous payouts and consumer satisfaction. With captivating music and mesmerizing looks, "Winners Ringer" proves to be an already won investment in any environment. Players simply press the start/drop button to release rings from the swinging arm and stack them around a poll directly on top of each other. Add to the fun and make the game challenging, speed of the swinging arm increases after each successful drop and the rings get smaller and smaller. Players can choose to accept a minor prize at the successful dropping of 7th ring around the poll or continue pitting their skills to win a major prize at the successful drop of the 10th ring. There are four pigtail prize hangers to display major prizes and five minor prize pigtail hangers. Innovation driven, "Winners Ringer" is set to become the most unique instant prize redemption game on the market promising enormous payouts and consumer satisfaction. With captivating music and mesmerizing looks, "Winners Ringer" proves to be an already won investment in any environment. Players simply press the start/drop button to release rings from the swinging arm and stack them around a poll directly on top of each other. Add to the fun and make the game challenging, speed of the swinging arm increases after each successful drop and the rings get smaller and smaller. Players can choose to accept a minor prize at the successful dropping of 7th ring around the poll or continue pitting their skills to win a major prize at the successful drop of the 10th ring. There are four pigtail prize hangers to display major prizes and five minor prize pigtail hangers.